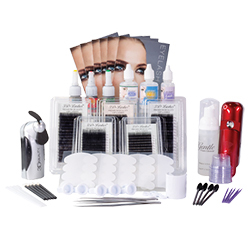 Complete and comprehensive starter kit with all the essential eyelash extension tools and products. Approximately 100 procedures. Kit includes: Level 1 Adhesive (Latex Free) - 5 mL, Level 3 Adhesive - 5 mL, Volume Adhesive - 5 mL, Adhesive Gel Remover - 15 mL, C2 Sealer - 15 mL, Gentle Foam Cleanser - 50 mL, Lash Toner - 15mL, VIP .15 C Curl (Mixed Length) 9mm -14mm, VIP .12 C Curl (Mixed Length) 9mm -14mm, VIP .07 C Curl (Mixed Length) 9mm -14mm, VIP .07 D Curl (Mixed Length) 9mm -14mm, VIP .10 C Curl (Mixed Length) 6mm -11mm, Biogel Eye Pads - 50 pairs, Educational Support Material on USB (USB is not equivalent to an educational course on lash extension application), Micro Applicator Brushes - 100/bx., Disposable White Combs - 25/bg., Lint Free Applicator Sticks - 50/bg., Mascara Wands - 25 pk., Curved Tweezer, Fine Point Tweezer, U-Band, Smart Rings - 25 pk., O-Disks - 25 pk., Clear Cups - 50/bg., Nano Mister Moisturizing Sprayer, Mini Fan, Tri-Fold Brochures - 50 ct.